In April 2006, South Mountain Peace Action set up a table in downtown Maplewood NJ to begin circulating a new petition called "A Responsible Withdrawal from Iraq," which is co-sponsored by Families of the Fallen for Change Click photo for full-size version. 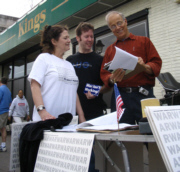 One of the first signers of the petition was Maplewood Mayor Fred Profeta, pictured here as SMPA member Agnes Brophy and Jamie Ross look on. The Petition seeks legislation in Congress to combine the FoF proposal for negotiations with all Iraqi factions, including the insurgents but not Al Qaeda, and Congressman John Murtha's resolution to end US military deployment in Iraq "as soon as practicable." The petition follows the February 8, 2006 Forum in Maplewood: "A Responsible Withdrawal from Iraq," co-sponsored by SMPA and FoF, which featured reports on 5 categories of Iraq withdrawal proposals as well as the President's "National Strategy for Victory." (3) After six months if such negotiations fail to take place or do not achieve reduced troop levels and reduced violence levels, the US will then proceed to end its military deployment in Iraq as soon as practicable.